A new 3G sports surface has given a tremendous boost to students at Brookfield Community College near Chesterfield, Derbyshire and to the community as a whole. The FIFA one star Domo Sports Grass surface was part-funded by the Football Foundation and completed last summer. There is a need to avoid cross contamination when carrying out a maintenance regime on a synthetic surface. 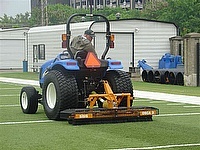 This can often occur if an existing ride-on is used to tow brushes that have both been previously used on a natural grass pitch. Not only is this mandatory to maintain FIFA accreditation, but also common sense. The need for a routine maintenance regime to get the best out of a synthetic surface, and to prolong its life, is a must. However, to fulfil an FIFA accreditation for a synthetic pitch it is important to avoid cross contamination, which could occur if you use an existing ride-on to tow a brush. 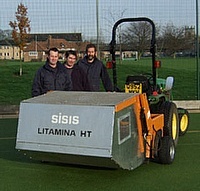 A dedicated machine should be specified such as a sisis Rosca ride-on brush system. Part of the Foundation of King Edward VI Schools is King Edward's in Edgbaston, Birmingham. This independent establishment has separate boys' and girls' sections offering education for 11-18 year olds. Extensive sporting facilities include 5 rugby pitches, 3 cricket squares, synthetic and natural hockey pitches, plus a First XV-First XI field with an athletics track for the boys, and netball and tennis courts for the girls.